The 59th GRAMMYs proved to be an interesting mix of the predictable and the unpredictable. Heading in to the night, you knew Adele was going to sweep the three major categories. The songstress took home all five gramophones that she was nominated for, including Record, Song and Album Of The Year. You also probably assumed (correctly) that the singer, nee Adele Adkins, would turn in a rousing performance of her hit “Hello,” proving to open the show on the loveliest of notes. James Corden? He was exactly what you expected: funny, not unsafe and collaborative. We saw the Carpool Karaoke segment coming from as far away as Justin Bieber or Drake were sitting (neither attended the show). Actually on the karaoke bit – why didn’t CBS, which broadcasts the Patriots games, pull in Tom Brady or Julian Edelman for that spot? The final product looked more real-life karaoke than of the edited, Carpool variety: some didn’t know the lyrics, others were a little off and I think everyone at one point contributed to the awkwardness. Then there were the political statements. From the subtle (Katy Perry wore an arm band reading “PERSIST”) to the not-so-subtle (A Tribe Called Quest complete with Busta Rhymes calling America’s Commander-In-Chief “President Agent Orange”). But hey, if you tuned in expecting not to see that then you simply haven’t been paying attention to the past year-and-a-half of our country. Sunday night’s award show, which rose slightly in the ratings from last year, threw us a few curveballs too. Metallica, who took the stage with Lady Gaga, would say that’s putting things lightly. First Laverne Cox introduces the performance by only mentioning Gaga’s name and then lead singer James Hetfield’s microphone wasn’t working. You didn’t hear Hetfield (mostly) and something you didn’t see were the stagehands in the commercial break after Beyonce’s performance. They had to use leaf blowers to clean the stage from confetti for the following act. Another incident you didn’t see: the fact that every vendor inside Staples Center closes for the show, yet there was a rogue McDonald’s dishing burgers and fries to hungry attendees through the stand’s side door in cash-only transactions. From what I witnessed, it appeared that someone from the venue came over and shut down the operation. Yeah, definitely didn’t expect to see GRAMMY-goers decked out in black ties and gowns while downing Big Macs. 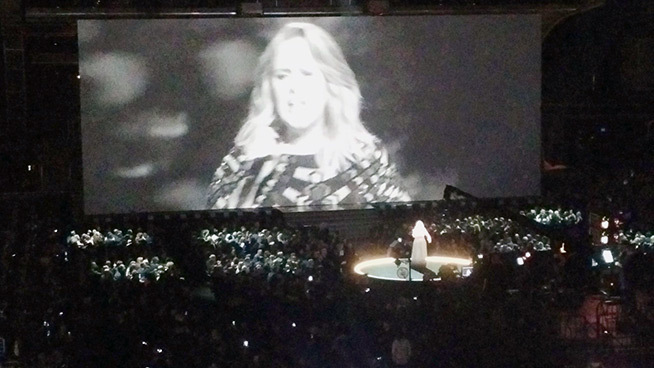 I also didn’t expect to see Adele have a performance-snafu… again. Remember last year? The microphone inside the piano fell over and caused a weird sound throughout the number. This year, the flub occurred while Adele was performing a rearranged version of George Michael’s “Fast Love” in tribute to the fallen star. The 28 year-old accidentally sang an uncensored line and immediately hit the brakes. Adele eventually reset and turned in another spectacular performance. Predictably, she stole the show. But no one could have predicted how. 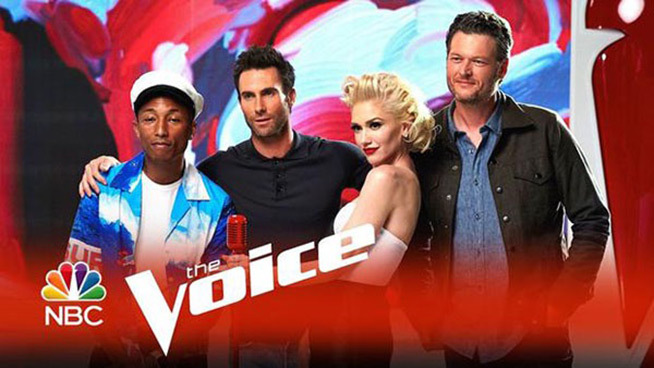 PageSix.com Senior Reporter Andrew Nodell phoned in for the latest “Weekend Scoop.” Andrew had news on Blake Shelton and Gwen Stefani’s new relationship, plus talked about Busta Rhymes’ day in court and Janet Jackson’s night out in Chicago.